When I was a kid the family traveled around the U.S. a lot. My father was a nature photographer and where we traveled was mostly dictated by where he had lectures, (for Audubon, more info about him here) and where the animals and landscapes were that he wanted to photograph. It was no trial, my sister, mother and I had some wonderful experiences and sometimes did other touristy stuff while he sat in a hand-painted camouflaged tent for hours. One thing that always made it on the list of side trips were Covered Bridges. I think there was a nostalgia trend for Covered Bridges in the 1970's. I remember seeing the image on lots of pottery and art of the time. They were all starting to go away and many people began chronicling them. Our family grew up in Southern California, so I think we were especially entranced with them. It wasn't something you saw in mild climates much. 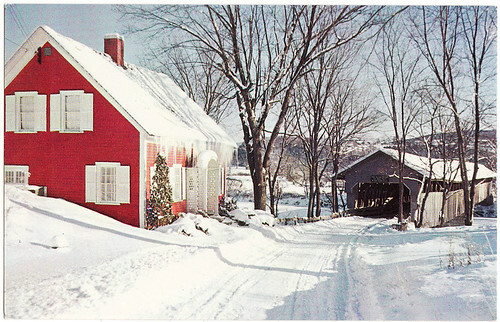 Covered Bridges were so charming looking and they added to the longing I had for real winters. Covered Bridges were created to protect the wooden bridges, most of which were made before the 20th century. With the elements from the weather, uncovered bridges would only last about 9 years. Once covered they could last about 8o years. 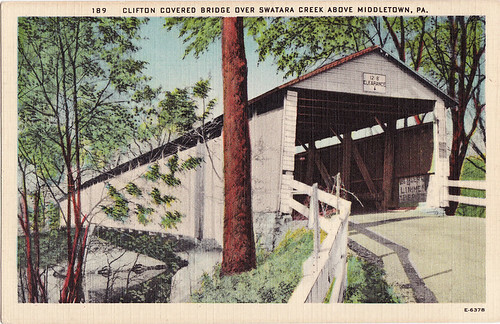 Here are a couple of postcards I have found of Covered Bridges. I still find them very charming.